After puzzling of the riddle for a short while longer, the party discover that magical light causes the statue to cast a shadow, where mundane light would not. They use the light to feed a shadow into the central bowl, where they ascertained was a secret door. This caused the door to swing open, revealing a descending stairway. Fearing an ambush, the group of adventurers head back into the caverns, fully exploring the doors they had not before. One was a black iron door with a grate and feeding slot. Into this they sliced up the corpse of the cult fanatic, disposing of his body into the belly of a hezrou demon trapped within. Behind the second door was a laboratory, stocked with potion reagent and alchemical equipment. At the rear of this room is a huge vault door. After picking locks and navigating puzzles, the party manage to break the vault. They send in Mark 9 to stash the haul of potions in their bag of holding, as he enters a magical trap causes poisonous gas to seep from the walls and floor, filling the room. Thinking fast the part command Mark 9 to close the door, preventing the gas spreading to themselves. Eventually Mark emerges with the loot. Further down the corridor, Vincent hears the pounding footsteps of something ascending the stairs. As he watches, a huge shield guardians bursts past the statue and attacks. It is followed by cultists. As the characters surround this construct, it casts Evard’a Black Tentacles, capturing them in writhing, ebony limbs. Despite this, the tide of battle turns against the guardian, and it flees back down. The characters do now pursue, instead taking one of the cultists that followed as a prisoner. At this point, a warty toad appears in the room. It is clear that it wants to be followed. The party do so, and it leads them down to the hag’s grotto. Here, a pair of green hags broker a deal whereby the adventurers will free their enslaved auntie, a night hag who is feeding souls to Skruul’s phylactery for the cultists. In return, the party will be escorted off of Whitepeak by the hags. Since their hag’s eye was destroyed, all of these vile crones are temporarily blind, and cannot help in the fight to follow. Seeing his opportunity to get an eye restored, Arannis trades the hags a magical wine skin for a new, albeit disgusting, insect-like eye. Attention then turns to the prisoner. The party wake him, then threaten to dip his head into the cursed stream. Welcoming martyrdom, he pleads for his death. Instead, Tullie casts Detect Thoughts and learns the location of the night hag auntie, and the use of the cotton balls they keep finding. Skruul’s wails cannot affect them as badly with these earplugs in. After this, the party head down into the dungeon proper. Torvald cast Detect Traps, marking a clear passage to the prison which they new was to the south. The pushed on, hoping to free the night hag from the cultists. As they entered, they were fired upon by guards in an elevated room. Thankfully the magical boots of Juan allowed him to bust into the room, and, with the help of the others, subdue the cultists before they could ring an alarm bell. Tullie went on to free the night hag; Sister Scorn. Having dealt with the hag, the party pushed on. They uncovered a store, filled with mundane supplies, and a torture room. Here they pillaged some soul gems, used to store the souls of tortured humanoids before they are fed into Skruul’s diadem phylactery. As they investigate the place, Arannis locates a secret door, concealed by magic, which he dispels. 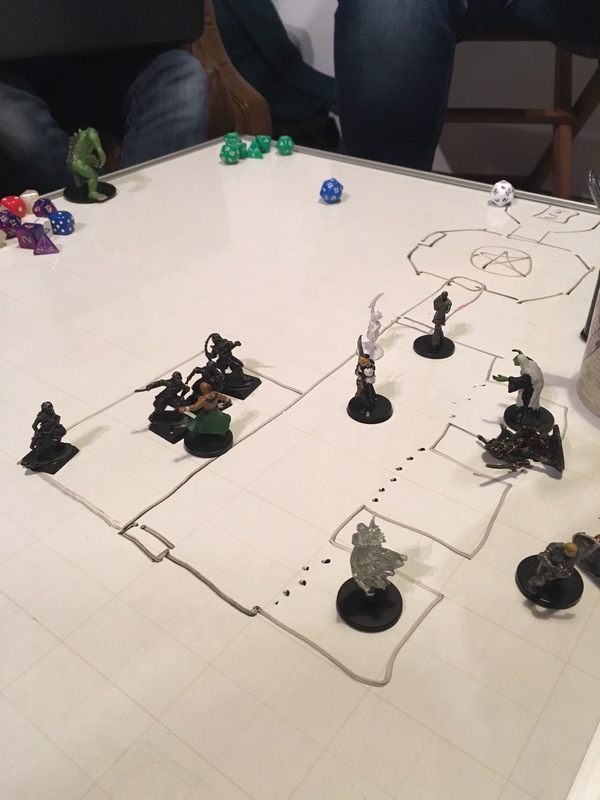 As he does so, two spectres emerge from the pit of guts and blood in the room, but the adventurers destroy them with ease. All eyes turn back to the door. Arcane sigils are inscribed upon its surface. It swings open to reveal a room filled with scrawled occult glyphs and runes. Hovering, waiting in the centre of the room is a demilich; Skruul the Reaper. If you’re liking this adventure, you can play it too! Check it out on DMsGuild!